This blog invites positive suggestions for changes that could be made to the parking in the village area. Please send us your ideas. We will publish them and use the options as a basis for discussion with the councils. The statutory consultation period for the proposed changes to the CPZ hours in part of Camden’s CA(U) zone is now over and we await the result. There has been a campaign against the changes led by the Highgate Society and as reported in the Ham&High . Those who have come out against the changes have many varied issues with the proposal. Whatever their validity, it’s impossible to make the case that parking is easy, fine and generally working well around the High Street. The changes might or might not make parking worse but there is no shortage of complaints about the current situation. The surveys conducted by the councils show that the parking spaces within a few hundred metres of the High Street are full all day long. (See this blog setting out the parking problem and another summarising all research .) It is hard to see why anyone would set off to the village in a car and have a reasonable expectation of being able to park near where they wanted without doing the rounds waiting for a place to come free – or double parking or parking illegally. So, regardless of whether this particular change goes ahead, if we are to improve things, what could we do? The HS web page noted a number of “points” to make in any response to the Camden consultation. Some of these made more sense than others. As the Forum, we would like to take the opportunity to clarify one HS comment: “Why was the requirement ignored in the Highgate Neighbourhood Plan for Camden and Haringey councils to work together over issues affecting Highgate?” The fact is that the Plan does not oblige councils to consult with each other on issues which are not part of the Plan. Transport issues such as this are not legally part of the Plan. Obviously we’d like the councils to coordinate more, its one reason why the Forum was started, we’re disappointed that they didn’t work together, and we try to encourage it. But when push comes to shove they are their own bodies on such topics and there was no “requirement” to work as one. We need to encourage such working. The HS note also questioned whether “the proposals will achieve the Council’s environmental aims”. This is a fair point but so long as Highgate’s roads are clogged up with traffic, old buses struggle up the hill, the school run is what it is, and the area’s parking spaces are used by many commuters, it seems hard to imagine that pollution will reduce. The Forum’s work on pollution makes clear the scale of the problem. No one action will reverse or solve the problem but every little helps. As seen elsewhere in London, cultural change about the use of private vehicles does occur over time. We agree that “Camden Council could work with Haringey to find a holistic solution which addresses the needs of the whole of Highgate.” But we also feel we ought to help the councils by offering possible solutions. We, the residents and businesses of Highgate, know the area best. Simply resisting change will get us nowhere, hence the offer in this blog. 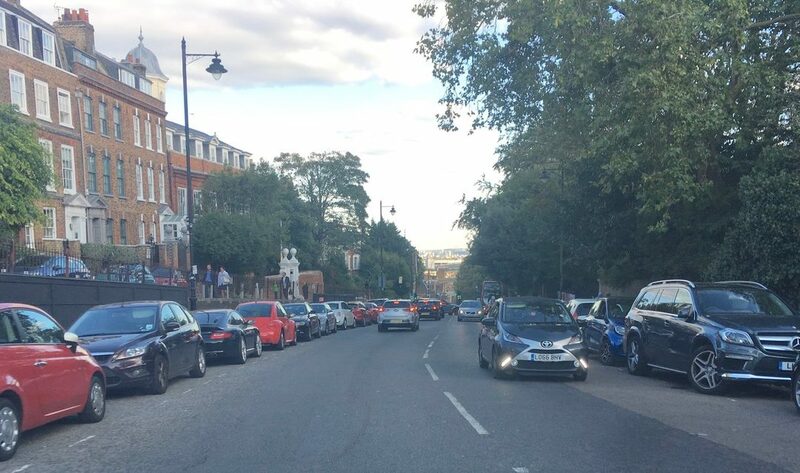 PLEASE SUGGEST WAYS TO IMPROVE PARKING IN HIGHGATE. The object is to have more pay spaces to allow the High Street shops and businesses to survive and hopefully flourish. Sadly this will mean many business permits will have to be withdrawn and some residential spaces turned into pay spaces. The CPZ hours could be changed to stop the almost all day use of pay parking spaces. Possibly a second time zone, say 2 pm until 4 pm added to the existing 10 am until 12 pm zone. This should apply to also to all new spaces in both Camden and Haringey sides of the immediate Highgate Village area. The Haringey side is not conducive to many more pay spaces. However there are opportunities in North Road by converting the residential spaces on the stretch of North Road in the Village where the spaces face the curb. Likewise in Southwood Lane for those residential spaces facing the curb. There is also the possibility for two spaces at the Village end of Southwood Lane where the road widens and there are currently double yellow lines. There is also the possibility of pay parking spaces in the middle of North Road between Casle Yard and the West Hill junction. Please note that currently Haringey have only 10 Pay spaces in the Village and these are only in the High Street. ( residents here currently have their own parking outside their front doors) by the reservoir and South Grove between The Flask and Pond Square. If implemented these measures should provide far more parking, help to reduce all day parking by commuters and reduce pollution considerably by reducing the necessity for visiting drivers to drive around and around to find a parking space. Many thank for reading my input.